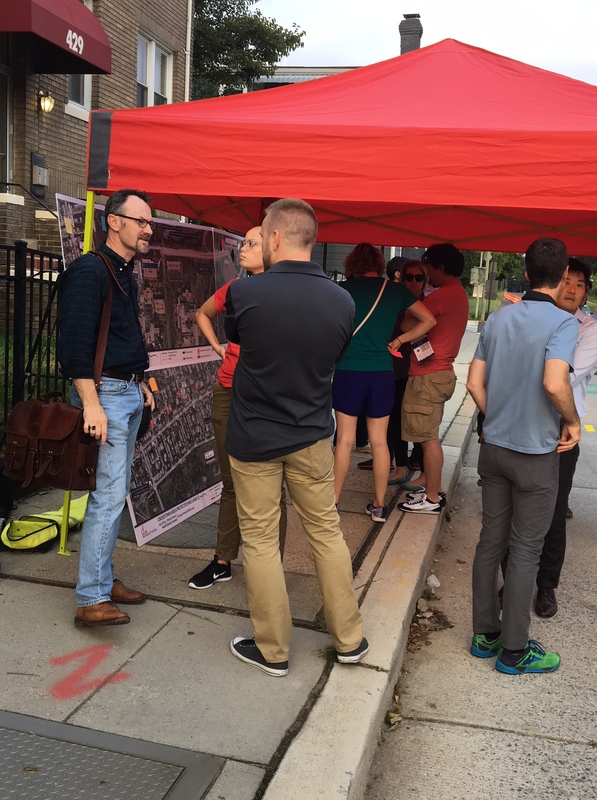 DDOT Bike Lane Pop-up on Kenyon Offers Good Insight | Park View, D.C. 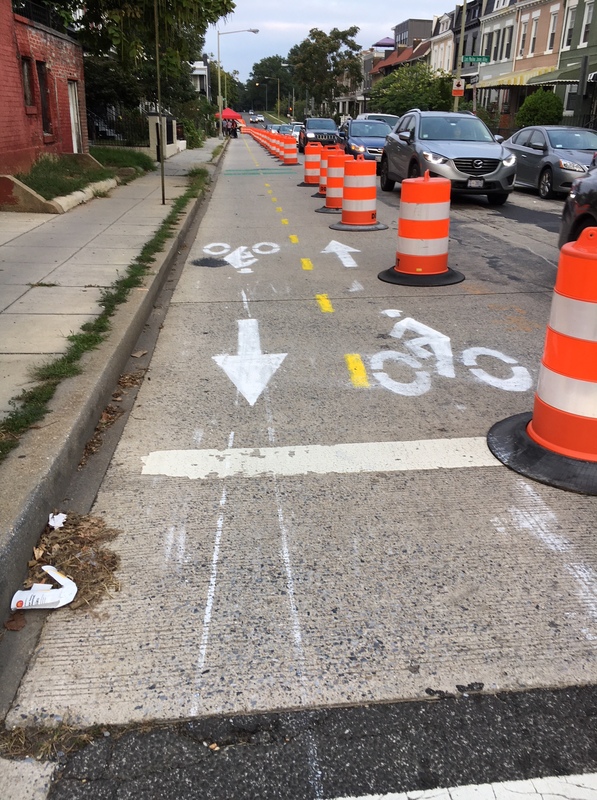 This entry was posted on September 24, 2018 at 10:04 am and is filed under Bikes, DDOT, Streets and Trees, streetscape, traffic, Transportation. You can subscribe via RSS 2.0 feed to this post's comments. A bike lane on Keyon is great, but it seems like they put the bike lane on the wrong side of the street; or at least forgot to paint a separation line between the bike lanes and the traffic lanes. As they have it, the contraflow bike traffic goes directly into oncoming traffic. Good idea, poor execution. Kent, you should do a survey and see how many of the houses in the study area have underutilized off-street parking. The city shouldn’t compromise on bike/green infrastructure just so some folks can park in front of, rather than behind, their homes. Kent, you mentioned Kenyon being one lane during rush, but during my visit another option mentioned was removing the parking on the south side of the street during rush and therefore having two lanes. I also asked about street cleaning days. Still many questions and I hope neighbors are participating. Agree that a study of underutilized off-street parking could be informative. I love the idea of increasing the number of trees along Warder Street. Thanks for the update. Where can one find the updated proposed maps you’ve included in this post? I can only find June 2018 materials on the DDOT Crosstown website. I’d like to see what the latest proposal looks like for the rest of Park Pl. 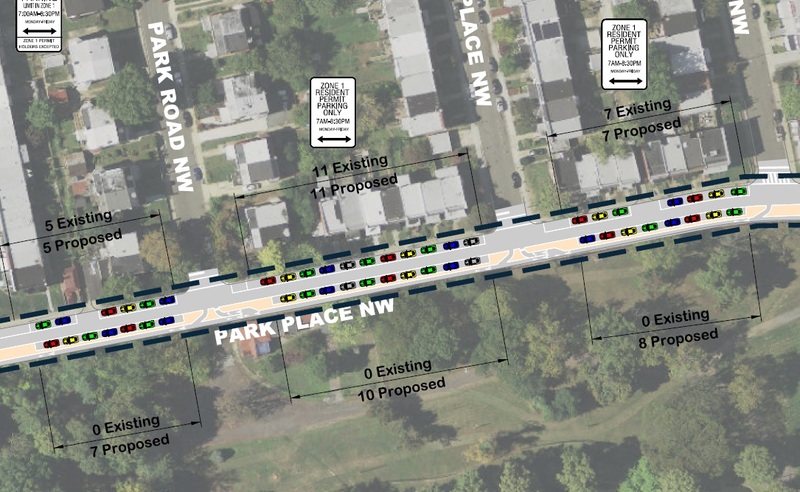 Are they suggesting padding the whole Eastern side of Park Place up and down with parking spots, or just a limited area? I’m stumped as to how I feel about it. I have been wanting a bi-directional bike lane, and to see Park Pl reduced to one lane of car traffic. It seems backwards and against the times to *add* parking, especially so close to a metro station, and obstructing what has given the neighborhood its name, Park View, but it might be a (awful) compromise I’m ready to make for my bike lanes and a safer slower 1-lane Park Pl.